Even under the best of circumstances, the noise, dust and general chaos of home remodeling is enough to drive people a bit bonkers. 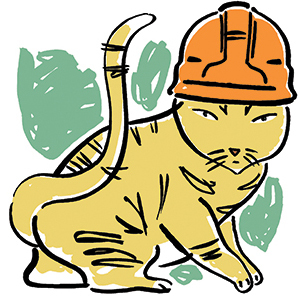 So imagine how stressful construction can be for cats, which thrive on calmness and consistency. Place your cats in a familiar room as far away from the construction zone as possible. Be sure they have food, water, litter boxes, bedding, toys and a radio to mask construction din. Each day, after construction workers have left, check for possible escape routes, such as holes in the walls or open windows or doors. Pick up small objects (nails, tacks and staples) that a curious cat can easily swallow. Secure any poisonous materials, such as paint, paint thinner or used brushes. Spend extra time petting or playing with your cats to ease your stress and theirs. Adapted with permission from Catnip: The Newsletter for Caring Cat Owners, published by Cummings School of Veterinary Medicine. For subscription information, visit tuftscatnip.com or call 1.800.829.0926.